Imitation is not always a form of flattery. 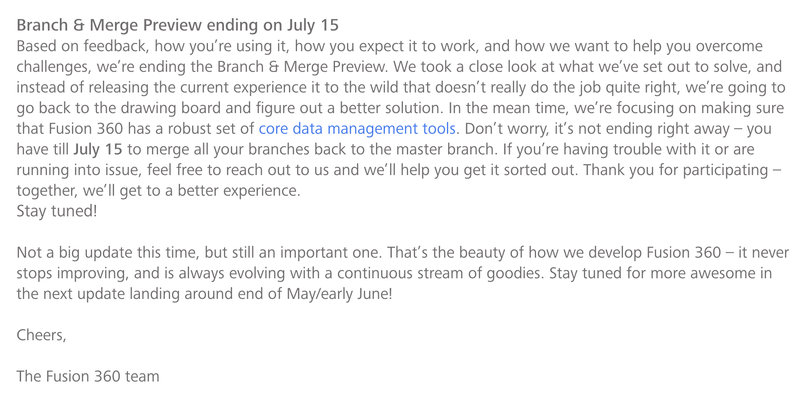 Onshape has included its Branch and Merge functionality since it was launched in Beta over two and a half years ago. Since then, we have seen a number of CAD software companies attempt to copy this functionality. Some have failed and gone back to the drawing board, while others have announced plans for what they claim to be branch and merge functionality. Regardless of which company has been doing the copying, they’ve all struggled with one very obvious limitation. Merging means that BOTH things being merged are represented in the final design. This capability is not new and it does not solve any of the real problems plaguing engineers everyday. Let’s take a look at a simple example. Let’s say my company designs dustpans and we’ve decided to create a new revision. For this new revision, we want to experiment with a few different changes. So we create a branch for each experiment and each engineer builds what he or she proposes as the next iteration of our design. You can see that Experiment A has added a saw cut feature and mounting bosses, while Experiment B has an angled boss at the end and stiffening ribs. Now what happens if you like features from both designs? If you are using Onshape, you can simply merge the two into one. Features from both branches will be merged into the final result. Below you can see that the merged dustpan has the saw cut features and mounting bosses of Experiment A and the angled boss and stiffening ribs of Experiment B. If you are using any other CAD system, you will be forced to re-create all the features in one file or the other. When today’s engineer hears “Merge,” they think of taking two different designs and combining features from both to create one. Mechanical engineers are becoming increasingly aware of the best practices in software development, which has long been reaping the benefits of merging their engineers’ best ideas. This is how Onshape’s Branching and Merging functionality works. You are able to explore different design ideas in their own branch, and later merge two ideas from separate branches into one. Not simply overwrite one with another. True branching and merging is now only possible with Onshape because it is the only CAD system built from scratch using a modern database-driven architecture. Traditional desktop-installed CAD systems, such as SOLIDWORKS, are fundamentally limited by their mid-1990s file-based architecture. Because of this core obstacle – which requires a complete software redesign to overcome – traditional 3D CAD companies are unable to rapidly innovate in the same way as Onshape. Interested in other examples of where Onshape is leaving SOLIDWORKS and other legacy CAD systems behind? Start with our unique approach to version control – and check out our most recent updates, including our new Sheet Metal Tab feature.